Strong yet slim, the ZAGG InvisibleShield Glass screen protector for Samsung Galaxy S7 is easy to apply, offers maximum protection and gives you a crystal-clear image. The InvisibleShield Glass screen protector from ZAGG delivers maximum scratch and stain protection for your Samsung Galaxy S7. Just 0.4mm thick, InvisibleShield Glass still delivers maximum scratch protection for your Samsung Galaxy S7. Thanks to the oil-resistant coating, it's easy to keep your display clean and looking great. 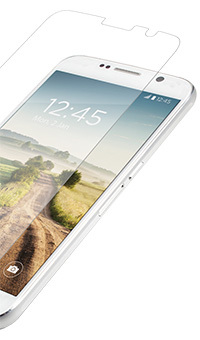 The smooth tempered glass gives you maximum image clarity and touch sensitivity.